On November 7, 1917, the Bolshevik party seized power in St. Petersburg, Russia, starting the communist October Revolution and leading to the founding of the Soviet Union. The sign these Russians are carrying says "Long live the Council of Workmen's and Soldiers' Deputies!" On November 7, 1917, members of the Bolshevik political party seized power in Petrograd (now St. Petersburg), Russia. This conflict ultimately led to a Bolshevik victory in the Russian civil war that followed, and the establishment of the Soviet Union in 1922. The October Revolution was actually the second Russian revolution of 1917. In March, revolutionaries led by the Petrograd soviet, or council, violently overthrew Czar Nicholas II, the leader whose family had ruled Russia for 370 years. The czarist government was replaced by a republic, largely led by Russian nobles. The majority (bolshe in Russian) of Russians were peasants and industrial workers. They did not support the new government. The communist policies of the Bolshevik Party, led by charismatic lawyer Vladimir Lenin, appealed to these working class Russians. Why does the October Revolution have a November date? 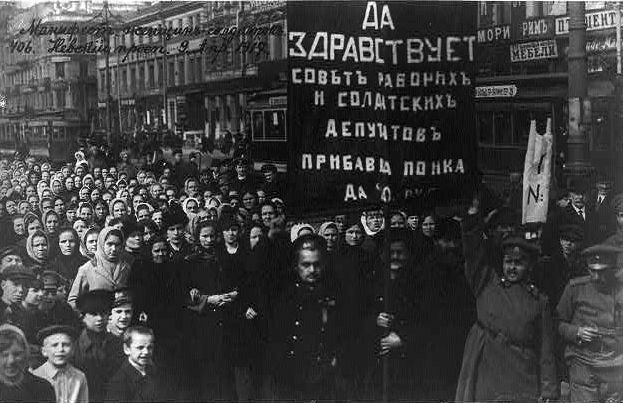 In 1917, Russia used the Julian calendar, which placed the date for the October Revolution on October 25. (For the same reason, the March uprising that led to the abdication of the czar is known as the “February Revolution.”) Today, Russia uses the Gregorian calendar, which dates the revolution to November 7.
to step down from a position of authority and power. capable of inspiring or influencing large numbers of people. conflict between groups in the same country or nation. person or group of people who support communism, a type of economy where all property, including land, factories and companies, is held by the government. group of people selected to act in an advisory, administrative, or legislative capacity. emperor or king of Russia. person born into a position with a high rank or class. person of low social rank and little social mobility in medieval society, usually a small farmer, farmworker, or owner of a houshold industry. organization led by a philosophy (platform) to guide or influence the government. social class of workers, usually performing manual labor.